Leeds United head to Middlesbrough on Friday night with hope renewed that they could yet play a part in the race for a top six place. A long overdue win, combined with some favourable results elsewhere have given the Whites the boost their season needed and head coach Paul Heckingbottom is pleased that people are still talking about the possibility of promotion. After his first victory since taking charge at Elland Road came against Brentford, he said: “Our approach is the same. The next game, that’s it. What will be will be this season. Who knows, you know? “Our view’s long-term on it. We want to keep improving and get better and better, so we can’t be making short-term decisions that’s going to damage us in the long-term. It will all be about the end goal. No-one is getting carried away after United went two months without a win prior to Saturday’s 1-0 success, but the victory, on the back of battling draws against fellow play-off contenders Derby County and Bristol City is an indication that things are turning round with Heckingbottom getting his message across to the players, particularly about being more organised. He added: You’ve got to have that (organisation). There’s not a team got promoted out of this league that’s carried players without the ball, not a team. “But then there’s other things to build on. There’ll be times when we’re not playing against a team like Brentford, when we’ve got to create and open a team up, we’ve got to be good at that. Heckingbottom will be hoping to have some selection decisions to make for the next game at Middlesbrough with at least one player back who missed the Brentford match. It has become a huge contest now with Middlesbrough in seventh place and also desperate for the three points. They are only three ahead of Leeds to show how tight the race for a play-off place has become so the Whites boss will be pleased that Adam Forshaw will potentially be available again in midfield to play against his former club after he missed out last weekend due to his wife giving birth. 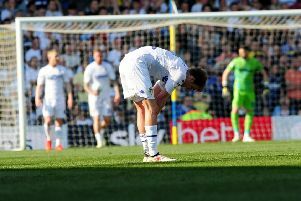 Kemar Roofe and Pablo Hernandez, who picked up knocks in the previous game at Derby, are more doubtful starters with the extent of their injuries still to be determined, although the former was reported to have only just failed a fitness test on the day of the Brentford game. Wide man Stuart Dallas picked up a knock in last Saturday’s game, but it is not expected to be serious. Left-back Laurens De Bock was left out against Brentford after enduring a difficult night at Derby with Heckingbottom explaining that his decision had been influenced by the football rule that states that teams have to have seven homegrown players in their squad. Dewsbury-born Tyler Denton benefited by being the seventh man as he took his place on the bench and he will be hoping to earn a chance to impress his new head coach in the coming weeks with the left-back position seemingly still up for grabs.